“I didn’t have time.” This actually means, “it wasn’t important enough.” It wasn’t a high priority, fun, distracting, profitable or urgent enough to make it to the top of the list. We need to lead with a deep appreciation for what is on people’s plates. We need to avoid innovation compression by clearing the way, closing existing programmes and providing people the resources they need to make things work. I think that hexagonal planning can be useful in helping with this process. February 1, 2019 February 4, 2019 Kind BookmarkTags Inquiry, Kath Murdoch, Time1 Comment on 📑 It’s about time we inquired into time…. Critical to the success of our experience with personal inquiry is the role of the teacher in conferring with learners. Far from being a routine that allows learners to simply “go off on their own” , teachers are working the room as coaches, guides, observers and co-researchers. Scheduled and spontaneous conferences are the mainstay of the teachers’ role during iTime. Kath Murdoch discusses the importance of conferring during the inquiry process. These conversations can contribute to formative assessment, getting to know students building trust, providing feedback and learning about learning. To support all this, Murdoch provides a list of tips and questions, such as providing multiple ideas if suggesting solutions or articulating what the child has taught you. I have found one of the biggest challenges with conferencing is to support students in owning this. In a different post,Tom Whitby discusses the power associated with communicating and conferring with parents and explains how this can influence our knowledge of students and the way they learn. Connect with places around your school in which you and your children can spend time in more natural environments. Build a relationship with your local parks, waterways, beaches, gardens. Go for walks. Walk slowly and learn to notice the small things. Nature is everywhere…even in the cracks of the footpath of the most urban street. Record what you see on your walks and take the same route each time to notice the subtle and more dramatic changes. Create a timeline in the classroom that depicts what you are noticing each month about the environment around you. Include photos, sketches and observations on the timeline. What birds are in the school yard at different times of the year? Which plants are flowering? Where are the shadows falling in the school yard? Encourage your kids to get to know nature in their neighbourhoods or back yards. Have them keep diaries or journals, take photographs and track the way that places change over a year. Find out what kinds of plants there are in your school yard. Keep track of how they grow and change over time. Start noticing the birds – what species are in the school grounds? Does it change over the year? Which birds are native? Introduced? What are their habits? Where do they prefer to hang out? Why? Connect with kids in other parts of your country or even state. What is their experience of the environment at simultaneous times of the year? Find out about the ways the indigenous people of your area identify seasonal change. Talk to your kids about what YOU notice as the days pass over the year. Model what it means to be fascinated by and connected to your environment. Marvel aloud at the changing seasons. This continues Diane Kashin’s conversation about place and my reflections on learning outside. When we stop judging students they stop judging and censoring themselves. They begin to actually learn. Even in a STEM class. Karen Cangialosi unpacks the argument that open pedagogy strategies have as much place with STEM subjects, as they do within the humanities. 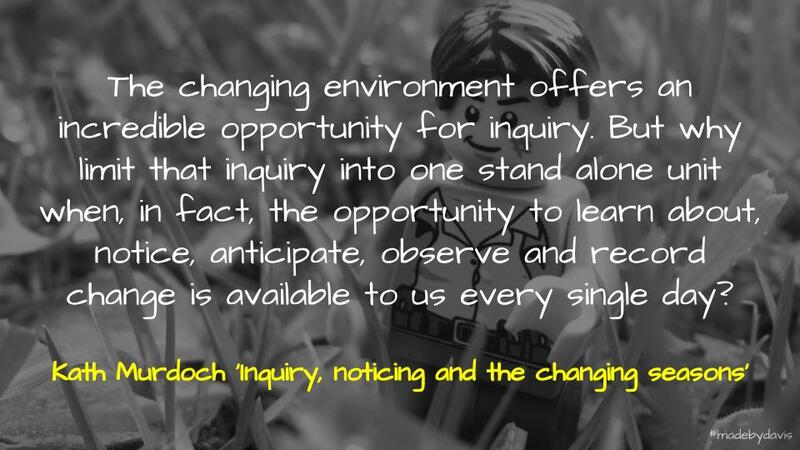 Kath Murdoch reflects on the endless requests for Inquiry posters. Even though she continues to refuse, believing that it should be a conversation had, rather than a rule followed, othera think differently. She therefore wonders about the ethics of sharing. This is an interesting read in light of creative commons and the creation of graphics. For those of us like myself who (all of a sudden it seems) mostly find themselves the oldest teacher in room, there is a strange sense of déjà vu about the flurry of excitement around agency. The challenge to rethink the way we ‘do’ teaching and learning and the desire to wrench schools from the transmission/factory-inspired model of the past has burned brightly within so many educators for a long time. It is not a new idea and therefore, not one to be dismissed as a fad or ‘the latest buzz word’. And this is far from another proverbial 'pendulum swing'. I am eternally grateful to those who have gone before. Those who have believed strongly that learning is not something that gets done TO us - it is something we do for ourselves. It is so exciting to see a globally respected organisation such as the IBO place learner agency at the centre of its enhanced program. There is something palpably different about the new rise of ‘learner agency ‘ in the contemporary landscape. Inquiry classrooms (and inquiry teachers) are constructed day by day, session by session. Being conscious of the choreography of our teaching and the degree to which it amplifies or diminishes inquiry is a powerful way to build culture over time. These ‘hacks’ are simple but by making one change, we can gain insights to which we have been previously blind. Hacker culture is about doing clever, creative things with technology; basically coming up with ways to apply our technical skills for the benefit of society. I am also reminded of hearing Will Richardson talking about changing 10% at a time. Although he was talking about becoming a ‘connected educator’, the same premise applies here. 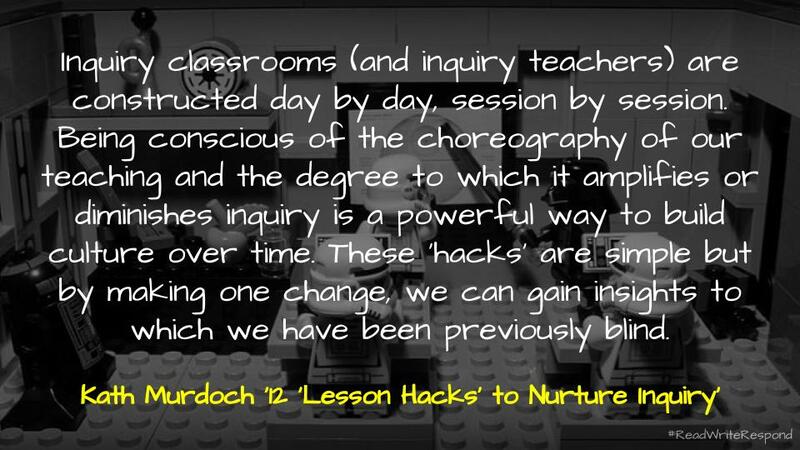 If a teacher were to apply all 12 hacks, I think that they would be well on the way to changing the whole of their classroom. Using an inquiry based approach to teaching and learning is multi-faceted. At its heart, inquiry is a stance – it’s about how we talk to kids and how we think about learning. It is also about how we plan and the contexts we both recognise and create in which powerful inquiry can thrive. These contexts can be highly personal (one child’s investigation into their passion) and they can also be shared contexts that bring learners together under a common question. These shared inquiries form a powerful ‘backbone’ of the primary classroom. HOW CAN WE DESIGN FOR OUR WELLBEING? WHAT MAKES A HEALTHY HABITAT? HOW CAN WE TEACH OTHERS ABOUT THIS SPECIAL PLACE? CAN WE CREATE OUR OWN RESTAURANT? BIN CHICKENS: WHAT’S THE PROBLEM? LET’S GET DOWN TO BUSINESS…WOULD YOU BUY THAT? WHY? WHY ARE MUSEUMS IMPORTANT – AND CAN WE CURATE OUR OWN? WHAT’S MY STORY – WHAT’S YOUR STORY? were emergent – these inquiries could not be planned in detail. The authentic nature of the journey meant that teachers and learners had to think on their feet and plan as the inquiry unfolded. got kids out of the classroom visiting restaurants, going to the museum, the local nature reserve…many of these inquiries depended on experience beyond the classroom walls. This is not a list of questions and/or units to roll out, but rather a source of inspiration. Along with her post on ten practices of an inquiry teacher, they provide some guidance going into the new year.